Yesterday we posted an Image based MCQ on Twin Pregnancy. Here's the answer for it. Q. What is the diagnosis of the given USG image? The correct answer is C. Diamniotic dichorionic twins. The twin peak sign (also known as the lambda (λ) sign) is a triangular appearance of the chorion insinuating between the layers of the inter twin membrane and strongly suggests a dichorionic pregnancy. It is best seen in the first trimester (between 10-14 weeks). While the presence of a twin peak sign is a useful indicator of dichorionicity its absence, however, is not that useful in confidently excluding it. It should be noted that the 'twin' in 'twin-peak' refers not to the presence of two peaks, but that it relates to twins. 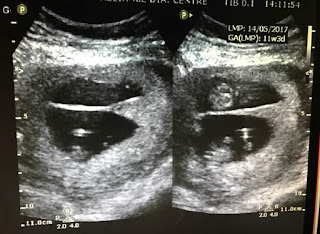 In pregnancies with more than two fetuses, the chorionicity and amnionicity of the each fetus may be different, and therefore this sign only aids in determining chorionicity of adjacent twins.